Dunsborough was only really intended as an overnight stop, but seeing as we were here, we went to take a look at Cape Geographe - the opposite number of Cape Leeuwin (in that it is on the same notch of land in South Western Australia, but facing north). Talk about staying power, though - we started to take a walk up to the lighthouse but gave up after 15 minutes of walking - yes, just 15 minutes! - and made for the van. We carried on the journey to Perth, stopping at Bunbury on the way. It looked like a very pretty town, the perfect holiday location by the sea. There were surfers everywhere, the most interesting-looking lighthouse we'd seen yet (another one for our collection) and a dolphin centre that promised opportunities of swimming with, well, dolphins - what else? As per usual, though, the time of year was just not right for swimming. Too cold, they reckon. I'd be willing to give it a go, though, but with no boat charters on offer it looks like I'm not gonna get to swim with dolphins on this trip after all (shame!). 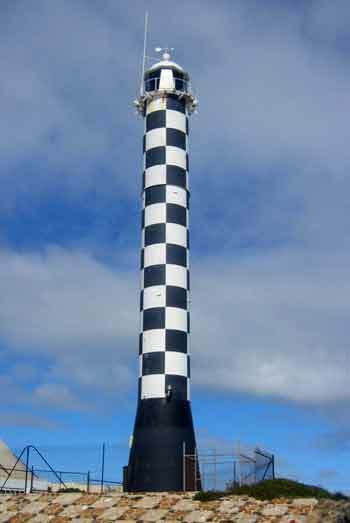 Bunbury Lighthouse has a checkered history, guffaw guffaw. So, on we ploughed once more, getting as far as Fremantle,or 'Freo' as it's called by the locals. It's just 20 kms south of Perth city centre and many Perth residents view it as a suburb of the city; the people of Freo might see it differently though. No sight-seeing for us today - that'll have to wait for another day.